Coral and I finally took a look at this online food trend! I'll get to the Blue Apron review shortly, but I do just want to take a second and make a note of how incredible the internet is. Not only do I make my living from a computer, but you can order entire meals online now that show up in a refrigerated box. There are a lot of these online ordering services out there, and I totally get the appeal for millennials (especially couples like Coral and I that don't have kids). We go grocery shopping regularly, but it's always been a little bit of a struggle to not buy too much food for just two people. 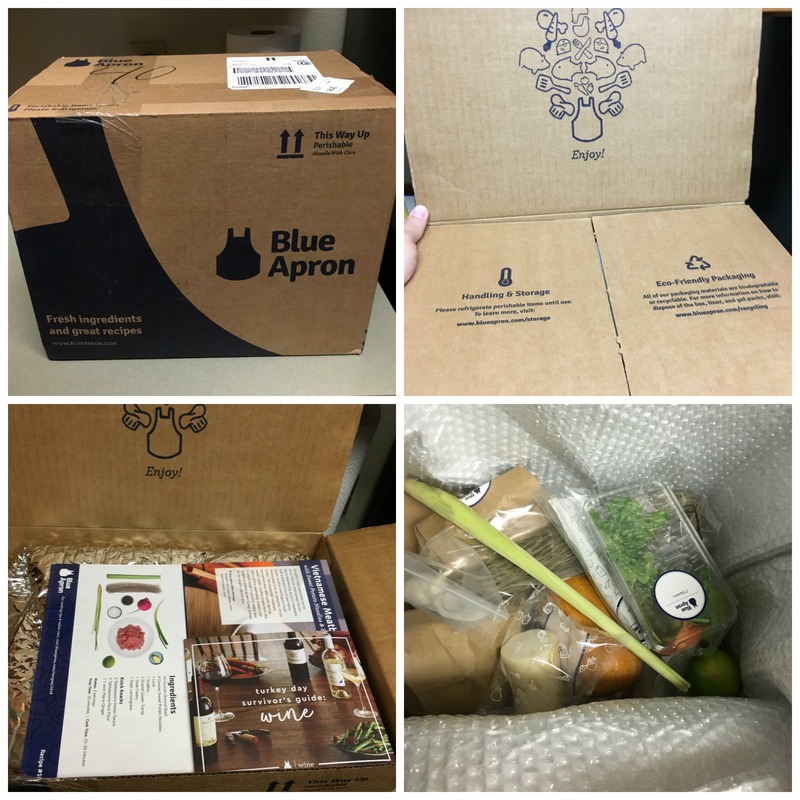 The official M$M Blue Apron Review! I plan on doing a review on all of these services separately, and then putting them together for a “mega-review” later on. One thing I want to point out – some of the advertising for these companies attempt to show this service as an alternative to grocery shopping, which I disagree with from a cost standpoint. But if you're looking for convenience and a way to avoid going out to eat, you may like this. Blue Apron costs $59.94/week for the “2-person plan” which has three meals, and the “family plan” costs either $69.92 for two meals a week or $139.84 for four meals. That works out to roughly $8-10 per person on each meal, which to me seems a little pricey if you are just comparing to your grocery store shopping. However, from our experience, most of the meals had organic fruits/vegetables and a lot of ingredients. We found the meals to be tasty, fairly easy to make (with some exceptions), and definitely a great alternative to going out to eat. My wife and I had fun making them because it was so different than what we usually make at home. My wife is a wonderful human being, but she has one massive, glaring, flaw: she hates seafood. Seafood is my favorite thing in the world, and somehow we've managed to keep our relationship intact in spite of her (she proofreads my posts, so I'm sure that she hit me right after that sentence haha)! I was a little concerned about her seafood weirdness before we ordered the meals – but you can actually choose what types of ingredients you'd like to exclude. They also have vegetarian meal options for all of my hipster readers out there! * 🙂 (Just kidding, you guys are awesome. But not kidding about the vegetarian meals). All of Blue Apron's food is packaged in the same facility, so if you have a serious food allergy I wouldn't recommend that you try this service! The food comes in a cardboard box, which is recyclable. All of the meat, fruits, veggies, seasonings, and extra stuff like honey is pre-portioned/individually labeled and packed into the box, along with the instructions and any substitutions that were made based on vegetable and fruit availability from Blue Apron's source farms. The refrigerated food is kept in a lower compartment of the box with cold-packs. I was honestly a little concerned about the food being kept at a cool enough temperature (last thing I wanted was to get sick doing a product review), but the refrigerated ingredients were surprisingly cold. 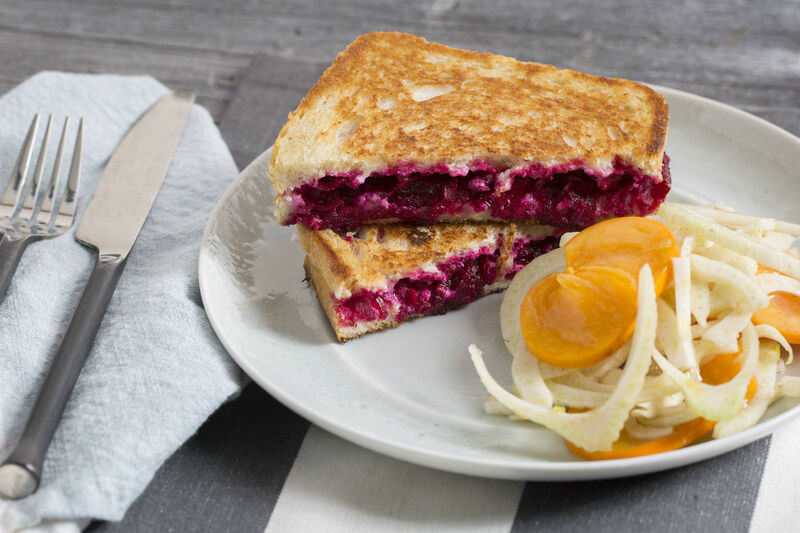 Of the three meals – the Ricotta and Beet grilled sandwich was our favorite. I was a little skeptical of it at first because it's an odd combo, but it turned out to be really freaking good. I guess the most interesting part about the meals was that they forced us out of our food “comfort zone” a little bit. We have had a pretty standard rotation of food since college, and even though we've grown our cookbook quite a bit we tend to stick to the things we know. The only real downside (some of you might not see it that way) was that there were a ton of vegetables to chop for all the meals. I think it was worth it because they added a lot of flavor to the meals, but I wasn't really expecting that much prep work. All of the extra seasonings and “knick knacks” (as Blue Apron calls them) were pre-portioned for every meal. No complaints there. We thought that the prep time on the meals wasn't very accurate for us. It took us about 10 more minutes per meal than what the recipes estimated, but it could be that we are slow at chopping or something. In the grande scheme it wasn't a big deal – but definitely something to note. 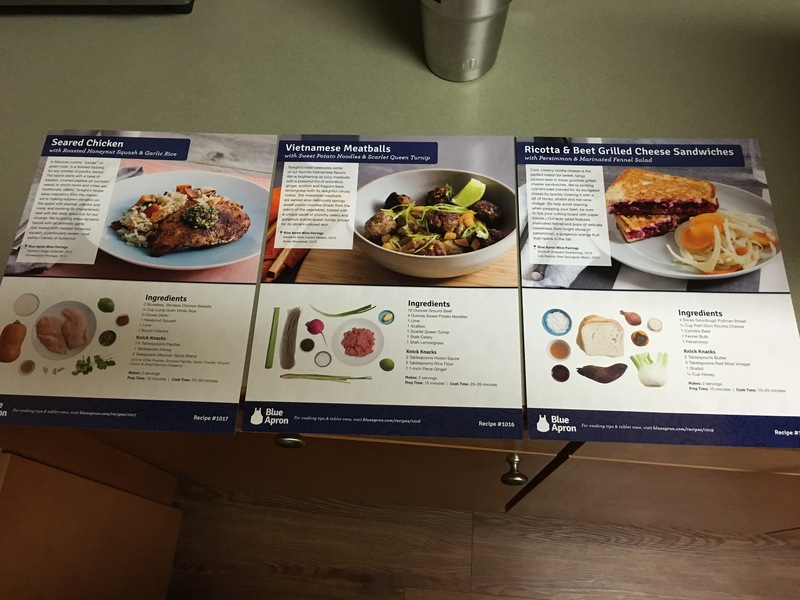 The actual cooking part was fairly easy – Blue Apron gives you a 8 x 10 recipe card with pictures of each step of the preparation process. It did use some fancy cooking terms that I honestly didn't know, but they actually had definitions on the sheet as well so I survived. My wife and I work together pretty well in the kitchen, so we actually had fun putting the meals together. I mentioned it above, but the vegetables and spices that they provide were way different than what we usually cook with. I liked that a lot, and for a non-foodie I did think that the meals had more flavor than most of our “go-to's” that we cook during the week. They were also interesting combinations (beets and grilled cheese? ), but they were tasty AF. In my opinion, the meals were comparable to something you would get at a restaurant. I was also a little surprised by the portions. They weren't crazy big like you would see in most sit-down restaurants, but it was definitely enough for the two of us with a little bit of left-overs from the side dishes. Overall, I was happy with the food. I think this is truly a good alternative to going out to eat from a money and probably calorie standpoint. One of the biggest “hacks” for this is that you can keep the recipe cards and make the same meals again later down the road. 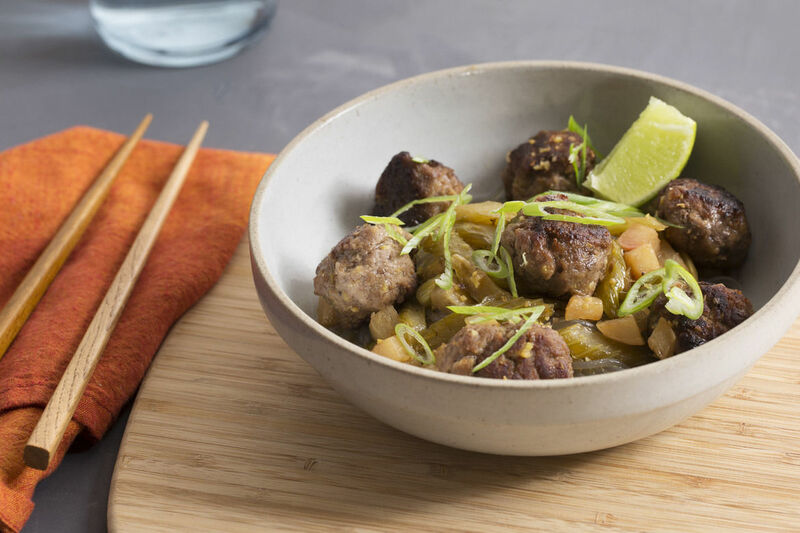 If you're looking to have a little more fun cooking some meals and want to avoid eating out a few times a week, give Blue Apron a shot and see what you think! You can also cancel at any time, skip any week you want to, and there are no shipping charges. *Vegetarian meal options are only available for Blue Apron's 2-person plans. Not available with family plans….yet! I’ve been using Blue Apron on and off for the past year or so. It’s great for the weekends. If the alternative is that you’ll go out to eat at a restaurant, then you’re actually saving money. Instead of spending $40 or $50 at a restaurant, you just spend $10 per person and you basically get a paint by numbers version of cooking! One thing I do is keep an eye out for when they’re giving discounts. They do it fairly regularly, so I’m often able to snag a box for less! Great tip! Yeah I think there’s a place for services like these, because the food is legitimately good. I’m not a big fan of saying it’s a good alternative to grocery shopping, but the eating out aspect makes a lot of sense. We’ve done this one and Hello Fresh a few times. My favorite part is learning how to cook foods that are outside of your norm. We now make polenta all the time and love it because we learned how in one of these box meals – and it was so easy! Another tip: if you’re like us and consider these a treat instead of a regular thing, when you have been cancelled for a few months the sites offer great welcome back discounts. Yeah that was definitely the best part for us – the recipes were totally different than what we are used to eating. Great tip on the welcome back discounts! We have ordered Blue Apron off and on for almost a year. We love it for the most part! Definitely agree that it pushes us out of our comfort zone – both in terms of the vegetables and combos of foods as well as cooking methods. It’s a bit pricey so we generally get about 1-2 boxes per month. Gathering the recipe cards and making the dishes again has definitely been one of my favorite parts of BA. No complaints when I have more recipes in my arsenal! I think that’s how we are going to use them too, it’s a nice alternative to going out. I did actually feel like I learned a few things in the process (how to prepare a beet, using fennel, etc.). We’ll for sure be using the recipe cards again. My wife and I use the Blue Apron app to cook our meals and find recipes. Some of the oddest meals/ingredients went so well together! Blue Apron is a great recourse even if you don’t use their delivery service. Glad to hear it – we were very impressed! 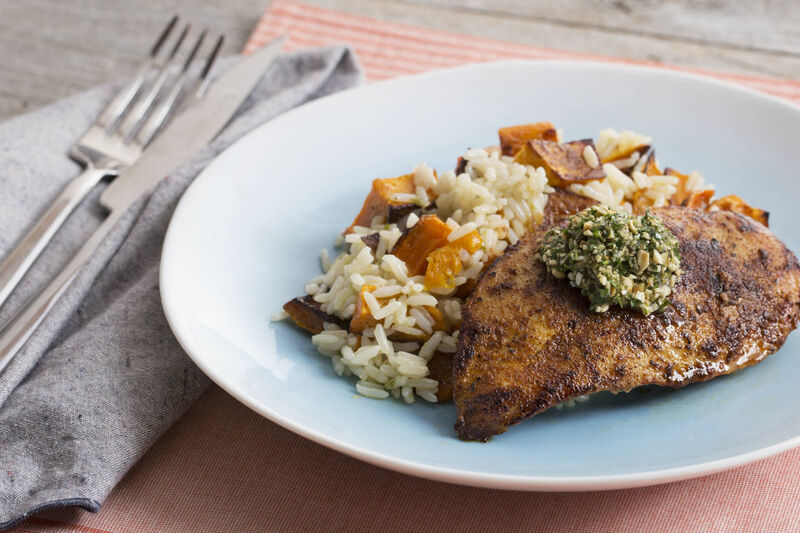 My wife and I purchased a few meals from Blue Apron, and overall it is a neat experience. I totally agree with the prep time taking longer then what the card says. There were even times where I felt like we spent so much time preping and we would finish eating it in half the time. It could have been the meals we picked. It definitely gives you the option to get out of your normal food routine. Extremely nice to have the exact portions and ingredients needed for the meal. The prep card was really easy to follow and had pictures to help with the prep. Overall though, I enjoy more hearty food (mashed potatoes and beef kind of person), compared to the healthier/organic type of food that tends to have less “flavor” in my opinion. It’s definitely worth trying out, but it didn’t stick long term for us. Cool post, keep up the good work! Thanks Nate – that’s a great review and similar experience to what we had. I didn’t mind the types of food, but we’re trying to eat healthier so it kinda worked for us. The prep part was weird, it was really just preparing a lot of produce that I had no idea how to cut haha. For the $29ish/three meals you can get with the link they gave me, it’s worth a shot!